Broadway Village is the result of the iconic collaboration between local real estate developers, John and Helen Murphey and their architect, Josias Joesler. The information used in this section has been obtained from “Joesler & Murphey, An Architectural Legacy for Tucson,” Click here for more info here. Acknowledgements: Lynn Barr, Framk P. Behlau, Stephen K. Brigham, Richard “Rocky” Brittain, Brian Cary, Robert C. Giebner, Robert Hiller, Harry Isikoff, R. Brooks Jeffery, the late J. Douglas Macneil, Stephen M. Malmoros, Linda Mayro, David Schafer and Marlys Thurber. The first suburban shopping center in the state of Arizona, Broadway Village was unique because it provided a one-stop shopping destination. When it first opened in 1940, the center had a gas station, grocery store, bakery, hardware store, beauty parlor, dress shop, music store and a drug store with a post office and soda fountain. The John W. Murphey Building Company was established to develop homes and commercial buildings in Tucson. Murphey graduated from the University of Arizona in 1920 with a degree in mining and married Helen Geyer in 1920. By 1927 the John W. Murphey Building Company had already built over 200 homes. The Murpheys decided that they needed help and hired Swiss born architect Josias Joesler. 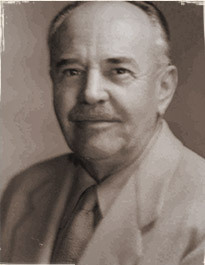 Then, in 1929, Leo B. Keith was hired as the financial manager for the company. 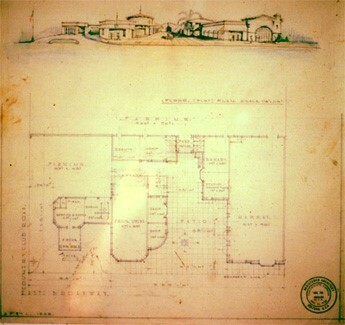 In the early 1930s, John and Helen Murphey homesteaded a parcel of land near River Road and Campbell Avenue. At first they lived in a tent and made improvements on the land which eventually included a small house. After three years, the land was theirs. More land was later acquired through homesteads in the names of other family members. The Murpheys acquired 7,000 acres of foothills land at state land sales in December of 1936. This 7,000 acre property located north of the Rillito River became their flagship residential development, Catalina Foothills Estates. They developed most of this property, creating several subdivisions and building hundreds of homes. The Murphey-Joesler collaboration commenced development of Broadway Village. Up until this time, Tucson’s retailers were located in and around the downtown area. Broadway Village would bring new conveniences to outlying residential areas with a market, drug store, hardware store and a gas station on the corner. Country Club Road was so named because the original Tucson Country Club was located adjacent and to the east. The Murpheys moved their office from Fourth Avenue to St. Philips Plaza in 1940. The original St. Philips Plaza consisted of five buildings around a central park. It included a church, restaurant, offices (including one for Joesler) and an artist’s studio. This was the gateway to the new Catalina Foothills Estates community. The Murpheys were co-developers of the Tucson Country Club Estates located off of Tanque Verde Road and Camino Principal on Tucson’s east side. This was the last major project of the Murphey-Joesler collaboration. Other notable projects developed by the Murpheys were Hacienda del Sol, which originated as an exclusive school for girls, the Catalina Foothills School, several fraternities and sororities at the University of Arizona, St. Philips Church, St. Michael’s Church, the Mount Lemmon Lodge and the Grace Mansion, also known as Eleven Arches. The Murpheys built the art deco building on the west side of Broadway Village, fronting Broadway Boulevard and Eastbourne Avenue. The building was designed by Juan Worner Baz, who was educated in Mexico City. John and Helen Murphey met Worner Baz on a trip to Mexico City and hired him to design “Casa de Juan Paisano,” their home in the foothills. In addition to the Broadway Village Annex, which was occupied by Table Talk for 30 years, Worner Baz designed various other projects around Tucson. Commercial Retail Investors and 4-D Properties acquired Broadway Village from the Murphey Trust. Vowing to be responsible stewards of this historical Tucson architectural landmark, this partnership immediately began the restoration of the bricks and mortar as well as revitalization of the merchant mix. With restorations and revitalization substantially complete in 2016, Broadway Village’s present and future is now every bit as exciting as its past.